Jamaican Rum Punch is one of the island’s most popular cocktail drinks. It shouldn't be all suprsing though, considering that we Jamaicans are lovers of rum, and incidentally, are producers of some of the finest rums in the world. There are many variations of the amazingly satisfying drink. It is also very popular at large family and holiday events. For example, rum punch is served as a complimentary drink at 'Wakes' and weddings. Read more about Wakes here. It is also a favourite at parties, reunions, as well as at Christmas and other holiday celebrations. 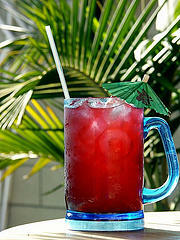 Rum Punch is very inexpensive when compared to other ready-made cocktails and take much less time to prepare. By the way, rum punch was said to be created by pirates and sailors who visited the Caribbean centuries ago. It is a testament to our blending of the East and West Indian Culture. The word “Punch” is said to originate with the Hindu word “panch”, which means “five”. A little poem was even conjured to aid in the remembrance of the portions to mix this savory drink: One of Sour/Two of Sweet/ Three of Strong and Four of Weak. Here is a list of basic ingredients that can be used to make some rum punch. Be sure however, to take your audience, and tastes, into consideration when you are making rum punch. Some persons like it really strong, like my Jamaican Rum Head friends but others prefer it a little milder. Mix all ingredients together and serve with party ice. Since there are so many variations (a video with another version is below) there are other ingredients which can be included in the recipe, like Bacardi Rum, Orange Juice - instead of pineapple juice, Honey, Sugar, and Appleton Dark Rum, etc. The glasses can be garnished with fruits or cocktail umbrellas. Give it a try nuh! Be careful however on the amount of rum you put in your drink. Rum Punch has a tendency to creep up on you, especially if you not a regular drinker. What Is A Wake - You Asked? A Wake is a Jamaican funerary tradition. It is also called 'Nine Night' or 'Set Up'. It can lasts for several days, with roots in African tradition. During this time, friends and family come together to the home of the deceased. They share their condolences and memories while singing hymns and eating food together. In the old days, the nights were calm and reserved for the most part - but that tradition has changed with the times. Today, these gatherings resemble parties much more than they resemble wakes (though this is not true for all “nine-nights”). See Also: What is a Nine Night in Jamaica? Back to Top of Jamaican rum punch. Return to Jamaican Food and Drinks from Jamaican Rum Punch. Make sure you subscribe to my free monthly e-zine My Island Jamaica Digest (MIJD) and stay with the latest!